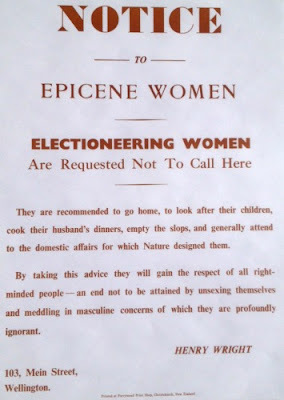 This well known poster "Notice to Epicene Women" from Wellington identity Henry Wright is an amusing artefact from the fight for women's right to vote in New Zealand. NZ was the first country in the world that had universal suffrage with an Electoral Act enfranchising women becoming law on 19th September 1893. The National Library has dated this poster's printing to November 1902 citing an extract from the New Zealand free lance 22 November 1902, page 6: "I wonder who "Henry Wright" is? He has issued a circular to "Epicene Women", who are interested in the elections, asking them not to call on him, but to stay at home and cook their husbands' dinners, and other things. Evidently a woman hater. Oh well, it is delightful to have such frank gentlemen living in Wellington. I am interested in the elections but I shall not call for "Henry Wright's" vote. There appears to be nothing epicene about him". Both the earlier and later usage dates could be correct if Mr Wright (and others - there is no record of how the size of the original print run) continued to provoke people with his poster for some years after the passing of the Electoral Act into law. But the actual date of first printing is almost certainly around 1893 rather than the National Library's date of 1902, it seems unlikely that even the most hidebound reactionary would still be bearing a grudge of such lasting intensity about women being allowed to vote a decade after the Electoral Act was passed that they would commission such a poster for its first use as late as the 1902 election. So who was Henry Wright? Henry Wright was a Wellington debt collector and business identity, here he is in a cartoon published alongside the following verse in Truth September 26 1914. A well-known man is Henry Wright. Though "stoney" [broke] blokes shun him as a blight. solemnly swear he's "The Wrong Mr Wright"
The Evening Post characterised Wright at the time of his death at the age of 92 in 1936 as "one of the city's best-known figures. He has been described as the most benevolent looking professional debt-collector in the world. He was usually dressed in a belltopper, frock coat, and check trousers, with brightly-coloured tie and an opal pin." This unique piece of NZ reactionary political propaganda has recently been re-printed using the traditional letterpress method (with moveable type laid by hand) by the letterpress enthusiasts at the Ferrymead Print Studio, the home of a superb collection of vintage printing equipment kept in working order entirely by volunteers. For sale at just $9.95 in NZ Fine Prints' vintage poster collection. Special thanks to the "Papers Past" digital repository of New Zealand newspaper archives for enabling this writer to research this article on the background of the man behind this old poster. to the domestic affairs for which Nature designed them. and meddling in the masculine concerns of which they are profoundly ignorant. Henry Wright 103 Mein Street, Wellington.